To develop and implement modelling strategies at the atomistic, mesoscopic, and macroscopic levels for understanding and predicting structure-property-processing-performance relations in industrially important materials. To design new, efficient algorithms and new, hierarchical approaches that overcome the limitations of traditional simulation techniques and address the broad spectra of time and length scales governing the behavior of real materials. To elucidate the fundamental processes which shape the performance of materials in specific applications for the purpose of faster and more economical design of new or better materials. Materials Science and Engineering is often depicted as a tetrahedron having structure, properties, processing, and performance as its apices (S.A. Allen and E.L. Thomas, The Structure of Materials, Wiley: New York, 1998; p 2). Research at CoMSE aims at developing computational methods that can elucidate/predict the relationships symbolized by the tetrahedron. A major challenge faced by materials modellers is that structure and dynamics are characterized by extremely broad spectra of length and time scales. This is depicted schematically in the figure below for polymeric materials. 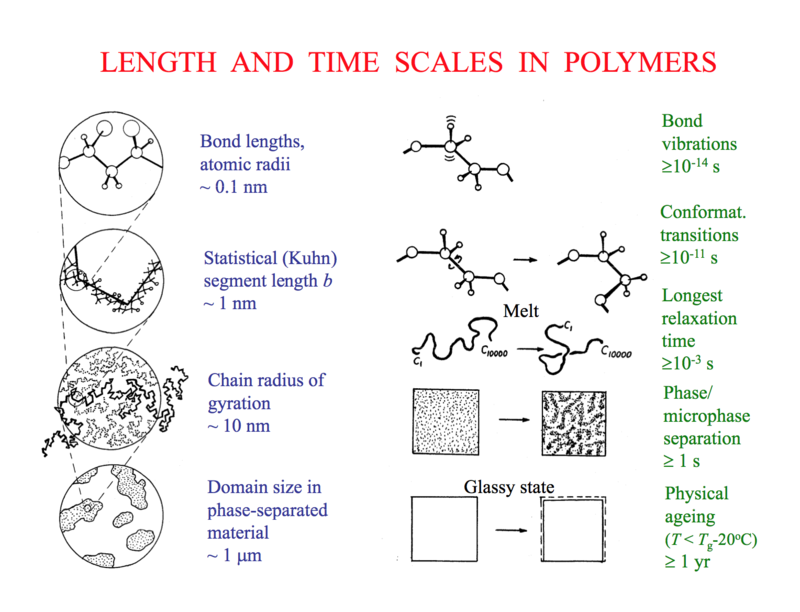 Characteristic times and length scales governing the physical properties of polymeric materials. By comparison, atomistic molecular dynamics simulations on the fastest computers available today can barely track the evolution of materials systems of length scale = 100 nm for times on the order of 100 ns. Clearly, a single modelling or simulation approach cannot address all properties of real-life materials. The development of hierachical, or multiscale modelling approaches is imperative. 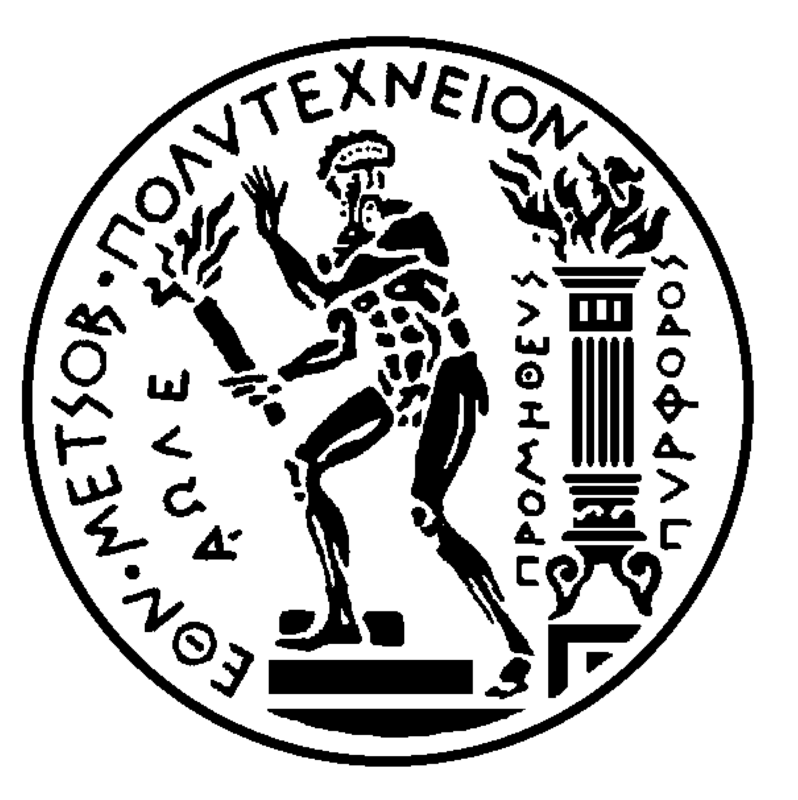 Such approaches consist of many levels, each level addressing phenomena over a specific window of length and time scales; links between different levels can be established through systematic 'coarse-graining' of the model used to represent the material. At the base of this hierarchy, powerful atomistic simulation algorithms are needed, which can efficiently sample the complex potential energy hypersurfaces of polymeric materials, ensuring equilibration over the relevant time and length scales. 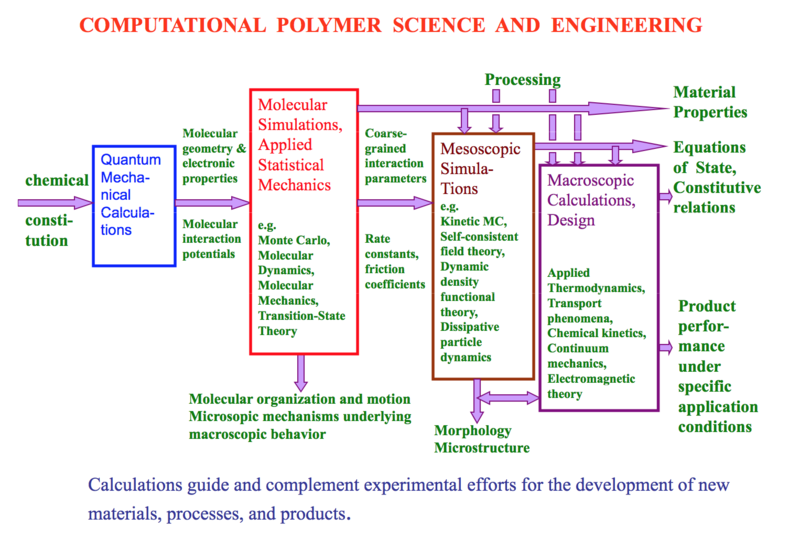 The figure below provides a rough picture of how multiscale modelling approaches to the prediction of material properties can be developed. Multiscale modelling/simulation efforts can guide and complement experimental efforts for materials characterization and new materials development; conversely, experimental measurements are essential for validating the modelling approach. Multiscale modelling can be practised strictly sequentially (separate simulations at different levels, passage of parameters or functional relations from one level to another) or in parallel (simultaneous modelling at different levels and self-consistent zooming in and out between levels).